You have seen the rest, now here is the best! More features, more comfort, and the best pricing of any racing seat design. Each seat features dual reclining mechanisms allowing for infinite reclining positions. 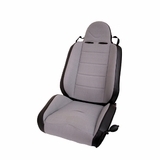 The special Jeep Specific design uses ultra dense foam and steel construction for greater comfort and long life. Side bolsters have been slightly expanded and designed specifically for both lifted and non-lifted Jeep vehicles. 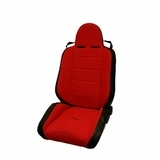 Special ball pump adjustable lumbar support provides the ultimate back support in a racing seat design. Woven fabric and vinyl construction give the ultimate in comfort and wearability. Each seat has three seat belt harness cutouts for use with a multi-point racing harness seatbelt. NOTE: 97-02 Wranglers require front seat adapter brackets 13201.11 (for drivers side) and 13201.12 (for passenger side) for these seats to mount on factory seat brackets. 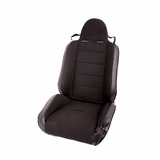 Replacement seating is offered for restoration or off-road use only. .